Evolutionists are denying obvious truths. In fact, the truths being denied are so obvious, one typically doesn’t even bother with a defense. If someone denies that birds fly and fish swim, do you bother with a defense, or do you simply tell them to go look at birds and fish? But Jesus took care to answer even foolish accusations, so let us do likewise. In a well known exchange about Jesus casting out demons, Jesus uses three separate rational arguments  to zero in on the obvious appropriateness of him casting on the demons. His arguments also point out the Pharisee’s hypocrisy of claiming that He could only do the miracles by tapping into the power of Satan. His response showed such claims were both utter nonsense, and that such accusations really only demonstrate that those making the claims were either hypocrites or under the power of Satan themselves. And thus Jesus showed the argument to be an easily defended attack on the truth, and a not so veiled attack against him personally. Likewise we’ll see these attacks are easily defended against foolish attacks on truths that should be obvious to all. 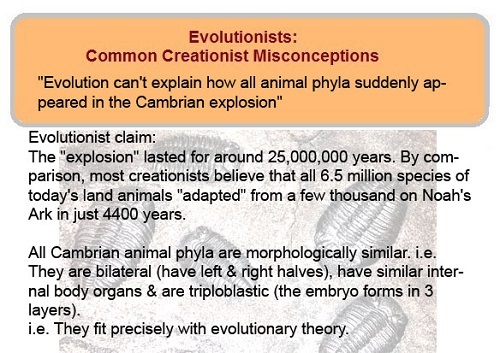 Meme: Evolution can’t explain how all animal phyla suddenly appeared in the Cambrian explosion. Informally, Phyla, (singular phylum from the Greek), “can be thought of as groupings of organisms based on general specialization of body plan.” Body plans can be thought of as the design of how the collection of body components are put together. For example, the body plan of horse – 4 legs, long body and neck; is different from the body plan of a human: 2 legs, 2 arms, short body, short neck. If you were to compare body plans; the body plan of a horse is closer to that of a lama than it is to a human for example. The body plan of a bird is radically different from all of those. Clearly evolutionists have no clue where body plans come from, yet they’re too blind or too hardened in their evolutionary faith to admit it. 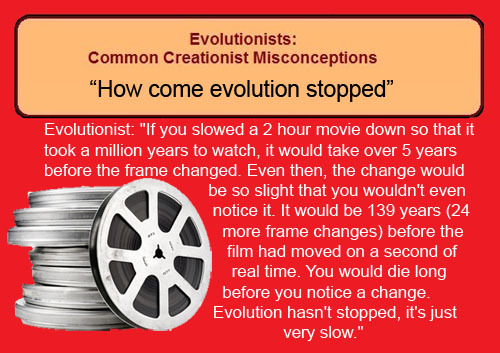 Meme: How come evolution stopped? Here the evolutionists are caught on the horns of another dilemma. They want desperately for evolution to be considered a hard science. Yet to be a hard science, the item being studied must be observed. But evolution – molecules to man evolution – is not observable. Again this is a rather obvious fact. Nevertheless, they object strenuously when you point out that molecules to man macro-evolution is not a science because it can’t be observed. To that objection – that evolution is never observed happening – evolutionists claim, it is happening, it’s just too slow to be observed. Well they can’t have it both ways. For evolution to be science it must be observable. But if it’s too slow to be observed, you can’t then say, it’s really happening, you just can’t see it. That is not science. That is no different from saying, there really are dark matter aliens, it’s just that we can’t see dark matter, and we can’t see aliens in general because they’re too far away. In both cases neither are science. They are clearly just story telling because science requires observation. In neither of these cases is there any hard observations of what they claim. Evolutionists simply do not want to accept the fact that what they claim to be science is really nothing more than a faith based religion in things they cannot observe – complete with all the trappings – faith: behavior shaping doctrine, a way to express your identity, outrage over denials of the faith, etc. First, well known atheist and evolutionist Richard Dawkins, though he probably won’t admit it, makes a nice case for the design apparent in nature. In his book “The Blind Watchmaker” Dawkins defines biology as, “…the study of complicated things that give the appearance of having been designed for a purpose.” In this one statement Dawkins refutes the entire premise of the evolutionary argument in this meme. But first, let’s look at what he acknowledges as true in this statement. 3. The design is meant to achieve a purpose, and that purpose is apparent. 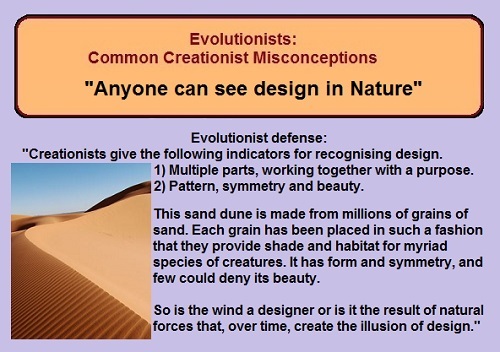 So this rather puerile attempt to refute design in nature fails whether you approach it from atheist assumptions, or from intelligent design assumptions. It in no ways refutes apparent design in nature in things like DNA, the bacterial flagellum, the blood clotting cascade, etc. But this feeble and fallacious argument does offer up other lessons: 1. This is a classic straw man argument – the arguments presented are, like a straw man – easily knocked down, and though not representative of what the opposing view (intelligent design) states, is used anyway for what appears to be an easy knock down victory for the one employing the fallacy (evolutionists) 2. Don’t be surprised when evolutionists misrepresent the views of creationists and intelligent design advocates. They do it fairly often, so you must be constantly vigilant like the Bereans (Acts 17.11) to check what they’re saying to see if they’re presenting facts and views correctly and accurately. For since the creation of the world God’s invisible qualities–his eternal power and divine nature–have been clearly seen, being understood from what has been made, so that men are without excuse. This entry was posted in Bible, Biology, Cambrian Explosian - The, Complexity, Evolution, Fossils, Intelligent Design, Irreducible Complexity, Logic, Macroevolution, Meme Mistakes and tagged Jonathan Wells, Paul Nelson, Richard Dawkins, William A Dembski by Duane Caldwell. Bookmark the permalink. Is it necessary to demonstrate “molecules to man” evolution for the creationist model to be effectively refuted? 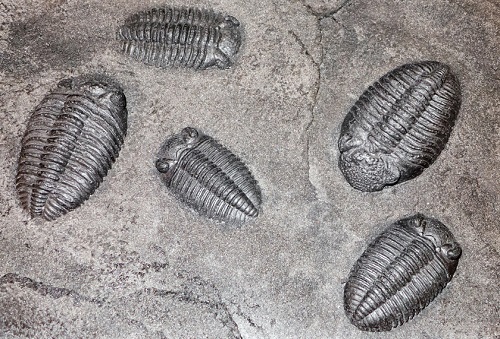 It seems to me, as a casual observer, the comprehensive evolutionary history of the planet need not be complete before the creationist alternative is shown to be untenable. For example, if (just arguendo) it could be conclusively demonstrated that humans and chimpanzees had a common ancestor, wouldn’t that be a rather direct refutation of special creation for human beings? Forgive me for responding to an earlier essay here, but it appears (I may be wrong) that comments for earlier essays are closed. Actually, no. There is no response to this in that article. Apparently you posted that comment while I was still writing it. There is a suggestion as to how one MIGHT respond to this point… but there is no actual response. Never mind, I found it. You’ve missed the main point that evolution cannot develop body plans at all. Period. Full stop. It is impossible for reasons that Darwin himself would understand, as Paul Nelson points out. (For further evidence of that point you need to read Stephen C. Meyer’s book “Darwin’s Doubt“, it is not the intent of this article to list all the reasons why that is true. If it is impossible for evolution to develop any body plans, then where did body plans come from? I have not missed that point. I have pointed out that it is a bald assertion and not a genuine argument that can be supported with evidence or reason. It is not impossible at all. It is not even particularly mysterious. I have read much of Paul Nelson’s work. He is not a rigorous scholar, and often objectively wrong. So too with Stephen Meyer. The body plans came from the same process that accounts for all evolutionary innovation; natural selection acting on the genetic variation found in any population of organisms. PS. I went and read your “Mt. Improbable” essay, You might be better served reading the work of real scientists, as opposed to the crackpots of the Discovery Institute. Of course you realize ad-hominem attacks do nothing to refute an assertion, right?